← Have a great break and happy holidays! Kick off the spring semester with The Susan B. Anthony Institute for Gender and Women’s Studies and the Department of Art and Art History at the 2015 (en)Gendered exhibit! The theme for the show this year is: Between Identities and Environments and we received many fantastic submissions this year ranging from painting and photography, to video and sculpture. Rachel Haidu, Director of Visual and Cultural Studies and Associate Professor of Art History, will deliver a gallery talk during the opening, and the (en)Gendered jury will announce the recipients of the Jurors’ Prizes and Honorable Mentions. If you have work in the show, please attend so you can claim your certificates and prizes if you are selected. 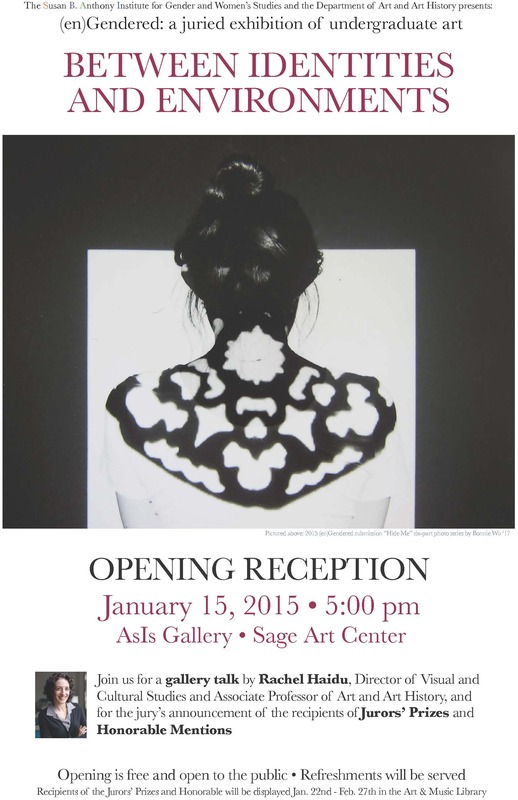 The opening is free and open to the public, and refreshments will be served. The (en)Gendered opening is always a wonderful way to begin the new year. We hope you’ll join us!